This pest even has it's own Smart phone app! Brown marmorated stink bug (BMSB) is an invasive insect that was first found in Minnesota in 2010 and has slowly been gaining a foothold in the state. This insect feeds on over 300 plants, including many important crops such as apples, corn, grapes, peppers, tomatoes, and soybeans. During the past two years, this pest has been found in apple orchards and soybean fields. Although crop loss has not occurred in Minnesota yet (it has in the eastern U.S. since 2010), it is only a matter of time. To help protect against BMSB, it is critical to find new infestations in Minnesota before they can become abundant..
To help identify BMSB, a free IOS and Android app has been developed by the University of Minnesota Extension IPM Program, in partnership with the Minnesota Invasive Terrestrial Plants and Pests Center and Purdue University. The app can be downloaded here, for both Apple and Android platforms. The main focus of the app is to help detect and report BMSB, but it also helps users identify native stink bug species common to the Midwest region. This free app, Midwest Stink Bug Assistant, will allow farmers, crop consultants, home gardeners, and the general public to become comfortable distinguishing stink bugs from other bugs and identifying common stink bugs. invasive stink bug or a native species. 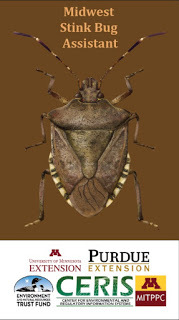 The app shows high-resolution, side-by-side comparisons of stink bug species to assist in identification. A key feature of this app allows users to easily report BMSB and other invasive stink bugs. If a suspected BMSB specimen is found, a photo can easily be uploaded by the user and a report generated through the app’s "Report Invasive" feature. Once your bug has been reported, a stink bug expert will be contacted to verify the identification. If approved, the new specimen record will be sent to the national database (EDDMapS) for monitoring the spread of this pest.